Most of the forms packages on this website are available in a single PDF document. Each document begins with a questionnaire, and as you answer the questions, the forms will automatically fill in your name and other needed information for you. You can then print the document and take the completed forms to the clerk’s office to be filed. For protective orders, no contact orders and restraining orders, you can also get assistance from your local domestic violence shelter. 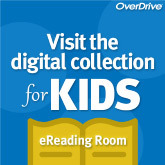 With OverDrive, you can borrow and enjoy free eBooks, audiobooks, and more from your library’s digital collection. All you need to get started is an internet connection, a library card and your MRL 4 digit pin number.